But it’s not just the government sector. The convergence of cloud, AI, and biometric identity assurance among other emerging technologies like the blockchain will change the way individuals interact with large organizations throughout the economy. We all need some kind of authentication process if we are to access information systems at work or at home. We know why we need to do it: to make sure we have access to our data and unauthorised people don’t. So why do we routinely ignore such advice[…]? Not all passwords protect equally valuable access. It turns out that many people are choosing weak passwords on low-priority systems like retail and media sites, and stronger authentication measures on high-priority systems like finance and work-related systems. This sheds light on why even rigorous security measures like biometrics are being applied to instances where people are willing to jump through more password-related hoops but find the password regime horribly inconvenient. The best thing for me would be a fast, easy and secure process, designed around me. Why can’t I use my biometric data to have a joined up experience? Without removing body parts, it is hard to steal from you. Biometrics would enable me to identify myself immediately. We agree; and we’re working on it. If it seems like things are moving slowly, it’s only because there’s a lot that had to be done on the infrastructure side first. A whole lot. More than two-thirds of UK consumers think that using biometrics – such as voice, fingerprint, iris and facial recognition – would be more secure and help reduce the risks of fraud. These findings were consistent with consumers across Australia, Singapore, Indonesia, Malaysia, the United Kingdom and United States. So as you can see using biometric scanners as a means to secure your home or office building is absolutely necessary. It is one of those things that you would be thankful for that human ingenuity worked towards your favor instead of against it. Much of the discussion of biometrics tends to represent the technology as something foisted upon ordinary people by governments or corporations. That is changing. One of the touchstones for the computer age and, more specifically, its insecurities and dangers, is the password. Very slowly, however, the password may be on its way out, both for stationary and mobile users. 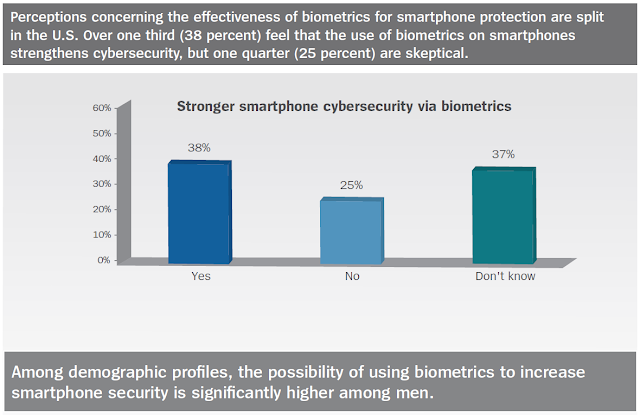 In favor are various biometric security measures. Lots of good links in the article. The survey, in general is concerned with data security and has interesting survey data reflecting the relative data security concerns of the United States public broken down by industry. Tractica’s forecasts indicate that key industries in the biometrics market over the next decade are likely to be finance, consumer devices, healthcare, and government, followed by enterprise applications, defense, education, law enforcement, and non-government organizations. Key use cases that are likely to drive biometrics revenue over the next decade include consumer device authentication, mobile banking, automated teller machines (cashpoints), government IT systems, point-of-sale transactions, pharmacy dispensing, and wearable device authentication. Biometrics May Ditch The Password, But Not The Hackers (NPR) — The piece itself is rather de rigueur, but the comments are a great way to start Friday. It looks like that Paypal piece was pretty widely read. Is Samsung’s Galaxy S5 ‘leaking’ YOUR fingerprints? Flaw means hackers can intercept and steal biometric data (Daily Mail); Forbes piece, here. The pair told Thomas Fox-Brewster from Forbes that the flaw lies in older versions of the Android operating system, up to and including Android 4.4. Subsequently, anyone running Android 5.0 or above are not at risk and the security experts are advising people on older models to update as soon as possible. The semi-technical press seizes upon biometrics as a proxy for personal data. This is old news, but here’s a great example. Get it? Exploiting the security flaw means that the whole device is compromised: Email apps, microphone, location information, and possibly even the contents of phone calls themselves, but according to the author and editor(s), the news value is in the possibility of capturing a fingerprint image. Of course, it’s their outfit; it’s their call. Not all mobile operating systems are created equal. Different mobile applications offer a different mix of privacy costs and benefits. Installing OS updates and patches is very important. If the OS is compromised, the applications it runs are vulnerable. Left out of the information readily available online about this hack is how the people at FireEye got their malware onto the hardware in the first place. Past “hacks” of biometric systems have been executed on a playing field that is far more favorable than the real world to the the hackers, where all the other layers of the security regime are stripped away from the one security link they want to test. Here’s a particularly striking example. If FireEye rooted the phone, side-loaded their malware onto the device, and went from there, this isn’t a hack in any real sense — it’s a malware test. That hypothetical scenario would mimic a real world example where a user lost their phone and bad guys got it, loaded software on it and then returned the mobile device to the user who continued as if nothing had happened. In the security world, if you lose control of the hardware, all bets are off for anything that isn’t encrypted (with a strong key). So, without more information, it’s hard to say how big a deal this is, or in many (most?) cases, was. In the bigger picture, this is a Google Android OS story. The subtext is that users who care about mobile device security should be thoughtful about what device/OS/app combinations they adopt, keep their device’s software up to date, and be careful about malware. As automated and convenient security including biometrics becomes better and more common, the highway robbers of the 21st Century are increasingly forced to turn to social engineering techniques rather than frontal assaults on security technology. He says external body methods like fingerprints are “antiquated”, and that internal body functions like heartbeat and vein recognition using embedded and ingestible devices are the future, to allow “natural body identification”. LeBlanc says internal devices could include brain implants, and that ingestible devices could be powered by stomach acid that runs batteries. Time will tell, I guess, but user acceptance has been has been a big issue for identity management solutions using biometrics. A bank asking customers to put something in their body in order to access their money would seem to be of another character entirely. Perhaps the analysis is meant to provide a perspective on what far-distant ID management technologies will look like. Even then, with the exponential growth of the computing power in “externally carried computers” i.e. smartphones, it’s hard to see how gaining a foot or so of proximity distance by moving the token inside the body lowers error rates enough to justify the mess. “We know how to identify machines. People are a pain. If we can just turn the people into enough of a machine, all our problems are solved.” In other words, engineering! There’s a problem here, though. If you turn the machines into people, the machines will probably get harder to identify. At SecurLinx, we’ll keep at it just in case. The question: when will biometrics take over from passwords? (The Guardian) — Four smart takes on large-scale customer-facing authentication.